Transferring money to your kids has never been easier. 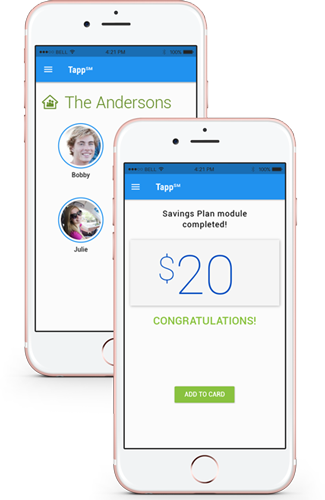 Tapp is our new private labeled solution for financial institutions. Cash rewards, automatic allowances & additional as-needed transfers made by parents are loaded to prepaid card, debit card, or bank account so kids learn responsible spending habits. Through its interactive financial literacy modules, TAPP can also teach kids life-ready financial skills. Acquire future customers at a younger age. Capitalize on current cash transactions. Generate new prepaid or debit card business. Choose The Child. Select the Amount. Hit "Send"
Now everyone knows how the money is being spent. Great value for both parents and kids. Drop us a note and let's start the conversation.